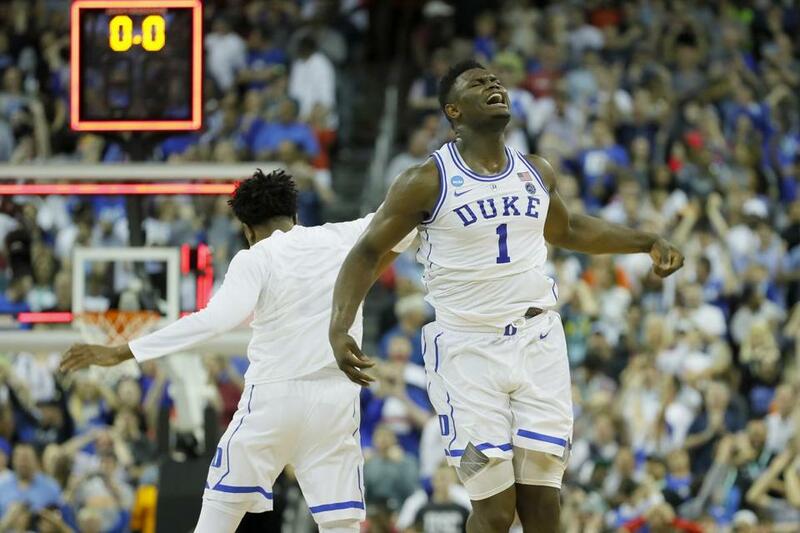 Duke freshman Zion Williamson (1) celebrates after the top-seeded Blue Devils avoided an upset against ninth-seeded Central Florida on Sunda in Columbia, S.C.
Zion Williamson took on 7-foot-6 Tacko Fall at the end and won. So did top-seeded Duke — barely — when two last-ditch shots by UCF rolled off the rim. Aubrey Dawkins finished with 32 points, but his tip-in try just missed Sunday, and Duke advanced with a 77-76 victory in Columbia, S.C., to reach the Sweet 16 and an East Region semifinal matchup against Virginia Tech Friday in Washington, D.C.
Williamson had 32 points, including a layup over Fall with 14.4 seconds left, and his team trailing, 76-73. Fall fouled out on the play and the 6-foot-7 Williamson missed the free throw, but RJ Barrett scored on a putback to put the Blue Devils (31-5) ahead. It looked as if Dawkins might take down his dad’s alma mater in the NCAAs. His last basket broke a 70-all tie and when Fall dunked Taylor’s miss — the play was reviewed for a possible shot-clock violation — the Knights were ahead 74-70. UCF missed a huge chance to go up six when it couldn’t quite on an alley-oop dunk attempt with 1:49 left, and Cam Reddish came back with a 3-pointer for Duke. Taylor made 76-73 with two foul shots with 45 seconds to go. Williamson then missed a 3, but Duke grabbed the rebound and got the ball back to their dominant freshman. Williams caught a pass left of the key and dribbled straight into Fall’s 7-6, 310-pound frame. Fall had stuffed Williamson three previous times and Duke’s young star was less effective underneath than he’d been his past four games. But Williamson got this shot to drop, shouting as he fell hard to the ground. Duke will face fourth-seeded Virginia Tech or No. 12 seed Liberty in Washington, D.C., on Friday night for a spot in the Elite Eight. Williamson, the game’s most explosive player, was clearly affected by Fall. Who wouldn’t be as the Knights senior stood 11 inches taller than Williamson and has a wingspan of 8-foot-4? Duke’s four fantastic freshmen combined for 72 of its 77 points. Reddish had 13 points and Tre Jones 11. It was the second straight sluggish start for Duke in the NCAA Tournament. But, boy, when the Blue Devils got going, it was a sight to behold as they closed the half with a 12-2 run to move in front. Trailing 34-32 in the final four minutes of the opening half, Williamson hit a short jumper, then collected Jordan Goldwire’s miss for a three-point play. Barrett added a three-point play and Williamson threw a one-handed bounce pass to a streaking Jones for an easy layup as Duke led 44-36 at the break. Williamson had 15 points in the first half, but had not dunked on the tall Fall — mainly because UCF’s center played just eight minutes due to foul trouble. The two were the focus of this one and at the start mimicked the start of the classic Rocky III final fight scene where a stone-faced Rocky Balboa stared straight at talkative Clubber Lang. The expressionless Fall played the Rocky part this time while the energetic Williamson bounced around before the game’s opening tip. Both players outjumped the referee’s toss, but Fall easily tipped it toward his teammates before Williamson could bounce up again. Virginia Tech 67, Liberty 58 — In San Jose, Calif., 6-10 junior forward Kerry Blackshear Jr. scored 19 points and grabbed 9 rebounds, senior guard Ahmed Hilll had 14 points, while senior guard Ty Outlaw added a double-double of 10 points and 11 rebounds to lead the fourth-seeded Hokies (26-8) past the 12th-seeded Flames (29-7) to a Sweet 16 matchup against top-seeded Duke in the East Regional semifinal Friday in Washington, D.C.
Houston 74, Ohio State 59 — In Tulsa, Okla., Corey Davis scored 21 points to help the third-seeded Cougars (33-3) reach the Sweet 16 for the first time in 35 years with their second-round victory over the 11th-seeded Buckeyes (20-15). Houston will face second-seeded Kentucky in the Midwest Regional semifinals. Oregon 73, UC Irvine 54 — Payton Pritchard scored 18 points to lead the 12th-seeded Ducks (25-12), the lone double-digit seed to advance to the Sweet 16. Oregon (25-12) will play top-seeded Virginia in the South Regional semifinal on Thursday. Virginia 63, Oklahoma 51 — In Columbia, S.C., the top-seeded Cavaliers got 14 points from Mamadi Diakite and 12 from Ty Jerome to clamp down on the ninth-seeded Sooners to make it back to the Sweet 16 for the first time since 2016. It helped erase Virginia’s stinging flameout a year ago when it became the first No. 1 seed to fall to a 16th seed in a 74-54 loss to University of Maryland-Baltimore County. Virginia’s win gave the Atlantic Coast Conference a national-best five teams in the Sweet 16 where the Cavaliers will face 12th-seeded Oregon in the South Regional semifinals. Tennessee 83, Iowa 77 — Two-time SEC player of the year Grant Williams scored six points in overtime and Tennessee (31-5) held off 10th-seeded Iowa (23-12) in a NCAA South Regional second-round matchup in Columbus, Ohio, to reach the Sweet 16 for the first time in three years. Williams had a pair of free throws, two jumpers, and a strip in overtime that helped the second-seeded Vols (31-5) pull it out and match their school record for wins in a season. He finished with 19 points and seven rebounds. Admiral Schofield scored 17 of his 19 in the Vols’ blistering first half as 10th-seeded Iowa (23-12) fell behind by 25 points and nearly pulled off a monumental upset, sending it to overtime tied at 71. North Carolina 81, Washington 59 — In Columbus, Ohio, Luke Maye and Nassir Little each scored 20 points and top-seeded North Carolina breezed past Washington. The Tar Heels (29-6) never trailed and moved on to face fifth-seeded Auburn on Friday in a Midwest Regional semifinal in Kansas City, Mo. Maye added 14 rebounds for North Carolina, a No. 1 seed for a record 17th time. The Tar Heels committed 10 turnovers in the first half, and led by eight points at the break. But they bolted out in the second half, put together a 13-0 run over 5 minutes and pulled away. Pac-12 player of the year Jaylen Nowell paced Washington (28-8) with 12 points. Texas Tech 78, Buffalo 58 — In Tulsa, Okla., Jarrett Culver had 16 points and 10 rebounds and Norense Odiase added 14 points and 15 rebounds for the third-seeded Red Raiders, who advanced to a Sweet 16 matchup in the West Regional against No. 2 seed Michigan. N.C. State 78, Harvard 77 — The second-seeded Wolfpack (24-11) held on for a one-point victory after the sixth-seeded Crimson (19-12) fell short in Raleigh, N.C., where Rio Haskett’s 3-pointer with three seconds remaining pulled Harvard within one. Bryce Aiken and Noah Kirkwood led the Crimson with 19 points apiece.